Christoph Nolte, Earth and the Environment, Boston Univ. Objectives: Governments and NGOs invest billions of dollars each year to establish new protected areas to combat continuing declines in biodiversity. Over the past 2-3 decades, mathematical biologists have led efforts to systematize and optimize how conservation funds are allocated. Software they have developed casts the task of identifying habitats for protection as an integer programming problem where the aim is to choose sets of potential protected areas that together offer complementary protection to species. 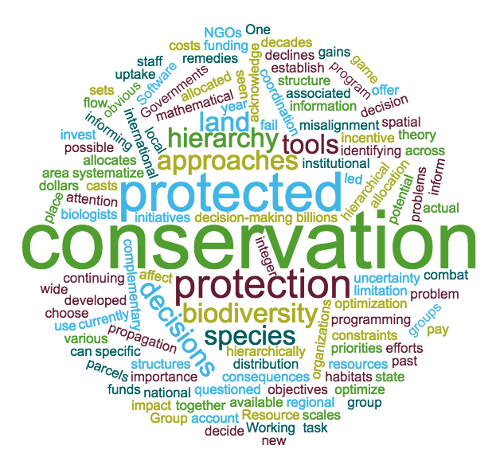 While such tools have seen wide uptake by conservation organizations, the impact they have on informing actual conservation decisions and any associated gains in biodiversity protection has often been questioned. One obvious limitation is that currently available tools and approaches fail to acknowledge the importance of institutional structures and constraints on conservation decision-making. Resource allocation decisions in conservation often take place hierarchically; a state, national or international program allocates funding and other resources to regional programs or other local groups where staff then decide which parcels of land should be protected. This Working Group will examine how spatial optimization approaches that aim to inform protected area priorities should take into account this hierarchical structure. The group will pay specific attention to objectives of programs at various scales in the hierarchy, information flow (about species distribution, land costs, etc.) and propagation of uncertainty across the decision hierarchy, and will use game theory to examine possible consequences of and remedies for coordination and incentive misalignment problems that can affect conservation initiatives. Meeting 1 Summary. This was the first meeting of this Working Group. The 2.5 day meeting brought together 15 interdisciplinary scientists, including computer scientists, applied mathematicians, ecologists and economists from four different countries (US, Mexico, Portugal and Australia). 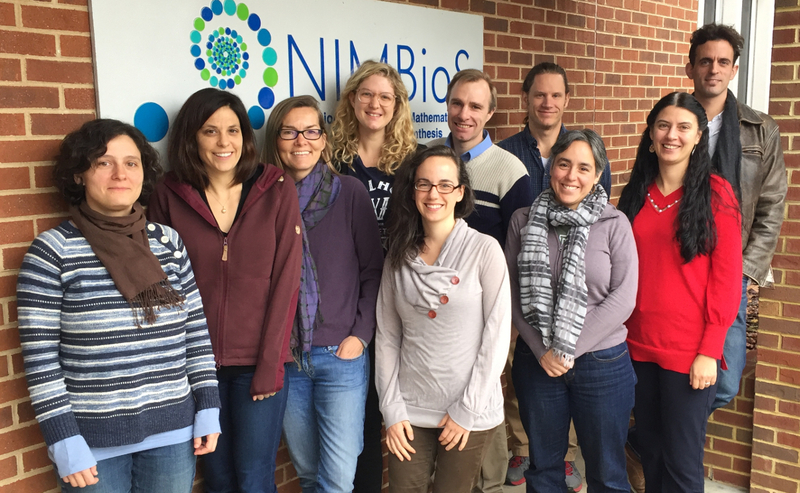 1 NIMBioS Fellow and 2 NIMBioS affiliated faculty participated. As this was our first meeting, the first day focused largely on meeting one another and developing a shared understanding of our focal topic. This included presentations exploring how the topic is discussed in different disciplines and what data are available to support applications. We also discussed issues like getting to a shared language for what we were discussing. We brainstormed on just which subquestions the Working Group was most excited about, a necessary step as this was the first time we had all come together. We then used a voting process to allocate participants to a set of break-out themes that would structure much of the remainder of the meeting. Day 2 started with a presentation about how organizational hierarchies shape actual conservation planning, focusing on biodiversity conservation programs in Mexico. The remainder of Day 2 and much of Day 3 went to break-out activities. Four inter-related break-out themes are advancing from this first meeting, each with an identified theme lead. Accounting for hierarchies in integer programming approaches to spatial prioritization for biodiversity conservation. lead: Armsworth. Quantifying spatial crowding in and crowding out in conservation interventions - lead: Nolte. Day 3 also included a plenary discussion agreeing on next steps and discussing general Working Group logistics. Finally after the conclusion of the Working Group, participant Dilkina gave a seminar presentation on accounting for connectivity in spatial optimization methods in conservation as part of the Baker Center Energy and Environment forum, which was attended by participants drawn from across the campus and within the Working Group. Meeting 2 Summary. Following on from our first Working Group meeting in October 2017, multiple work-strands and projects were moving forward. Some of these were large multi-collaborator activities. Others were smaller involving twos and threes. We chose to focus this second Working Group meeting on the two largest of these collaborative efforts, which are also those Working Group activities to have made most progress already. We will revisit other work-strands later on. These two work-strands emphasize interactions between different kinds of actors and across different levels of institutional hierarchy that are relevant to conservation planning. One examines interactions between national managers and regional conservation agents within conservation organizations. The other focuses on how conservation organizations can better account for the needs of local communities within their conservation planning efforts. Meeting 3 Summary. Working Group analyses in this meeting focused on two major work-strands both examining interactions between different kinds of actors and across different levels of institutional hierarchy that are relevant to conservation. Both work-strands build on mathematical biology literature that applies constrained optimization techniques to identify future priority locations for protected areas on the landscape. These approaches embed details of spatial heterogeneity and spatial interactions within and among species and habitats that determine the efficacy of potential networks of protected areas. One innovation that provided a focus for our analyses in Meeting 3 concerned how better to account for the way local human communities use the landscape in such optimization approaches. The needs and aspirations of local communities regarding surrounding ecosystems have often been ignored in large-scale planning in conservation. Our analyses show how better accounting for the way people use local landscapes for grazing and hunting as well as other ecosystem services can markedly change what areas emerge as priorities for protection. The second key innovation area that we focused on in the meeting was to embed a better representation into relevant optimization approaches of how decisions are actually taken by conservation organizations. Typically, the set of protected areas ultimately chosen as a priority for future protection is determined by a combination of decision-making processes taken by conservation practitioners working over different spatial scales. Our second major set of analyses focused on how available optimization methods could be adapted to integrate these layered institutional interactions.